Holy Irish Cream and Coffee! If you like a splash of Baileys Irish Cream in your Coffee… you are going to want to kiss my face for this Irish Cream ‘n Coffee Bundt Cake. Guaranteed. Just imagine it… Your two hands wrapped around a large mug of piping hot coffee, with a hefty swirl of Baileys Irish Cream, topped with whipped cream, chocolate, and caramel drizzle. You sip and the creamy sweetness (and caffeine) massages your throat on the way down, like a hug from the inside-out. That, my friends, is what I’m serving you today, in bundt cake form. Coffee. Chocolate. Caramel. And silky Baileys Irish Cream all baked into one glorious cake to share with friends. And I love bundt cakes. They are dense enough to be sturdy, yet soft, moist, and naturally pretty due to their shape. 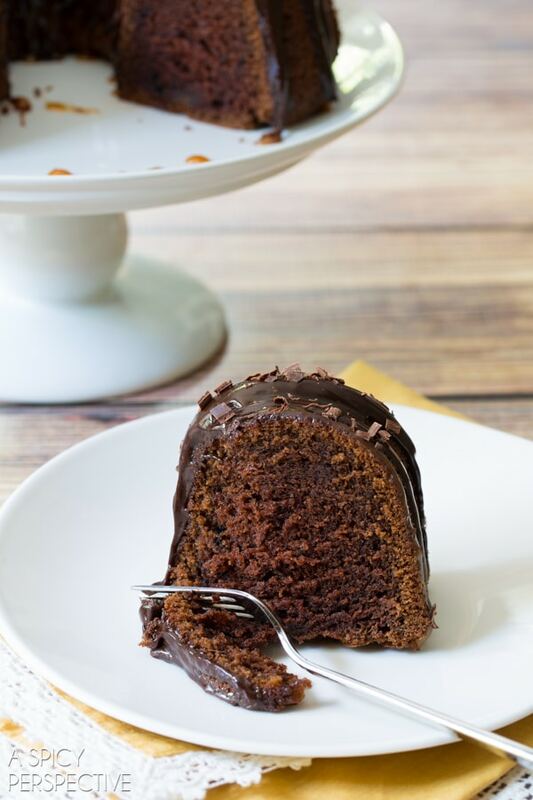 This Baileys Irish Cream Bundt Cake is truly one of my favorites! 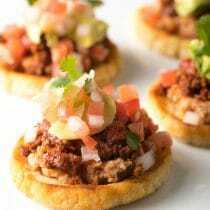 It’s rich and comforting, with a note of boozy coffee in each bite. The most import thing(s) to remember about all bundt cakes, it that they need time to cool in the pan before flipping. Usually 20 minutes will do, but sometimes I wait 30 minutes, just to be sure. There’s nothing worse than flipping a cake out of the pan and watching it break in half. Along with waiting, it’s highly important to make sure your pan is well greased and floured. I like to spray bundt pans with the non-stick baking spray that is made with flour, instead of buttering and flouring the nooks and crannies. My last tip is to wait until the cake is completely cool to add toppings. Otherwise the toppings absorb into the cake, instead of setting on top of the cake. 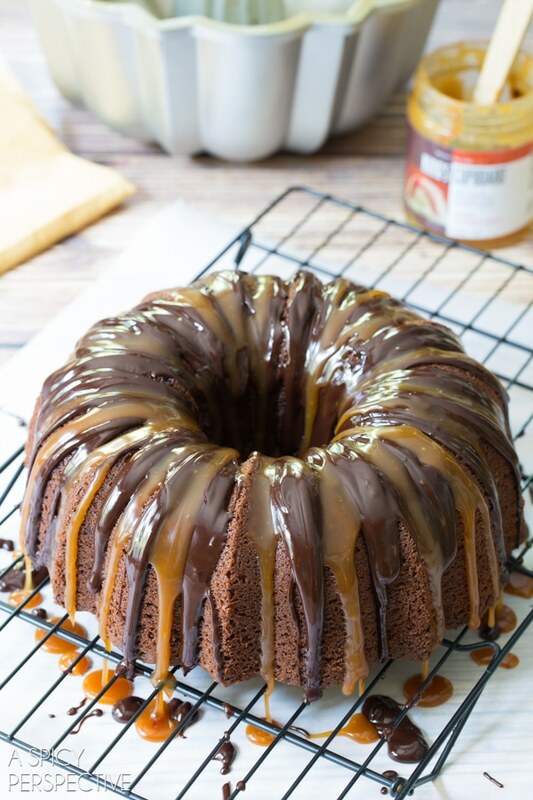 See how the chocolate ganache and caramel drip down the sides and dry, instead of disappearing into the cake? Patience is a virtue when it comes to bundt cakes. 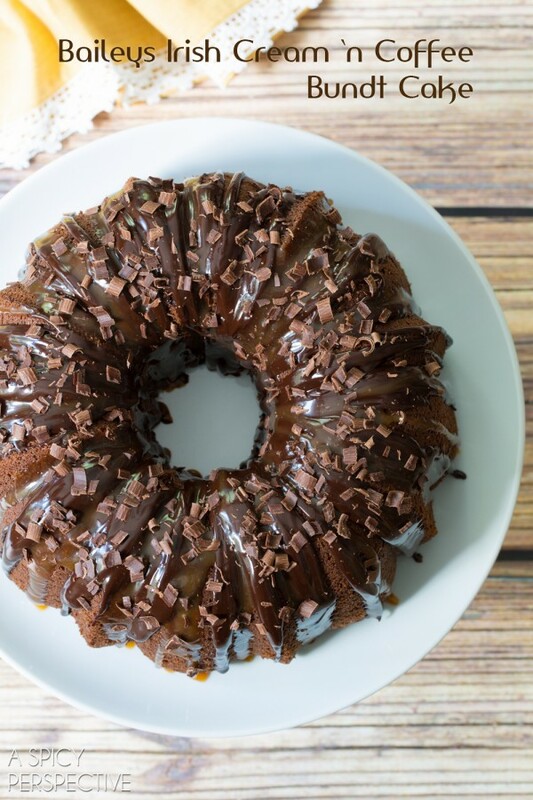 This Baileys Irish Cream ‘n Coffee Bundt Cake is a sure-fire way to make someone smile. 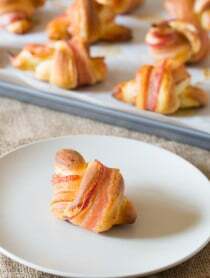 Try making it for an office party, or for a neighbor who has had a rough week. You’ll be amazed at what a little (ok… a lot) of Baileys Irish Cream and Coffee can do! Need a few more Bundt Cakes in your life? 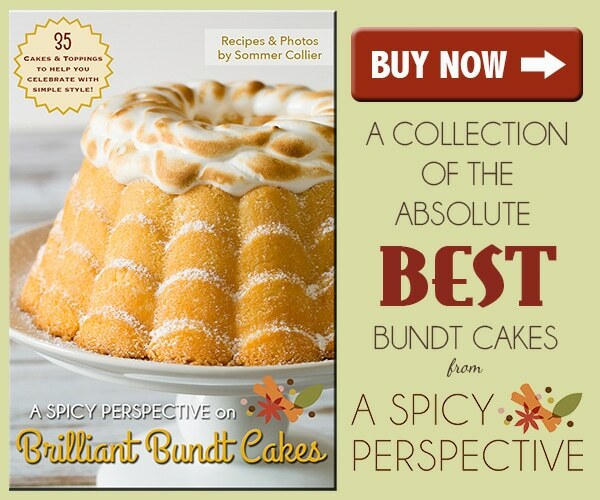 Check out our brand-spanking-new ebook, Brilliant Bundt Cakes, packed full of the best bundt cakes you’ll ever taste! Holy Irish Cream and Coffee! 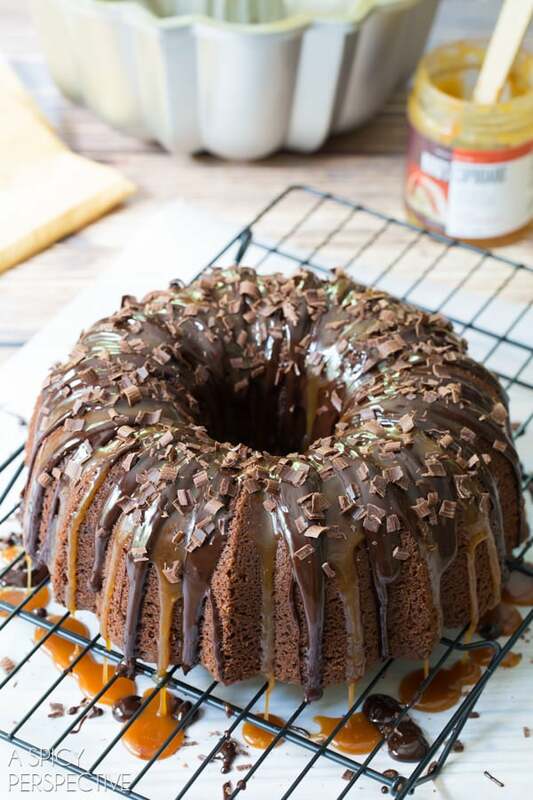 If you like a splash of Baileys Irish Cream in your Coffee... you are going to want to kiss my face for this Baileys Irish Cream 'n Coffee Bundt Cake. Guaranteed. 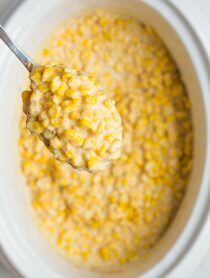 In the bowl of your electric mixer, combine the first six dry ingredients. Turn the mixer on low to stir. Then slowly add in the remaining five wet ingredients. Turn the mixer off. Scrape the bowl. Then mix again until smooth. Pour the batter into the prepared pan and bake for 45-55 minutes, until a toothpick inserted into the center comes out clean. Allow the cake to rest and cool for at least 20 minutes before flipping. Flip the cake onto a wire cooling rack and cool to room temperature before topping. 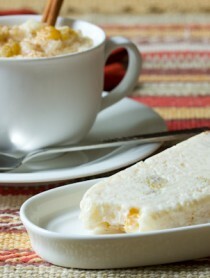 Once the cake has cooled, bring the cream to a boil (in the microwave or on the stove). Remove from heat and add the chocolate chips. Allow them to sit in the hot cream for 5 minutes, then stir to combine. Place a piece of wax paper under the wire cooling rack. 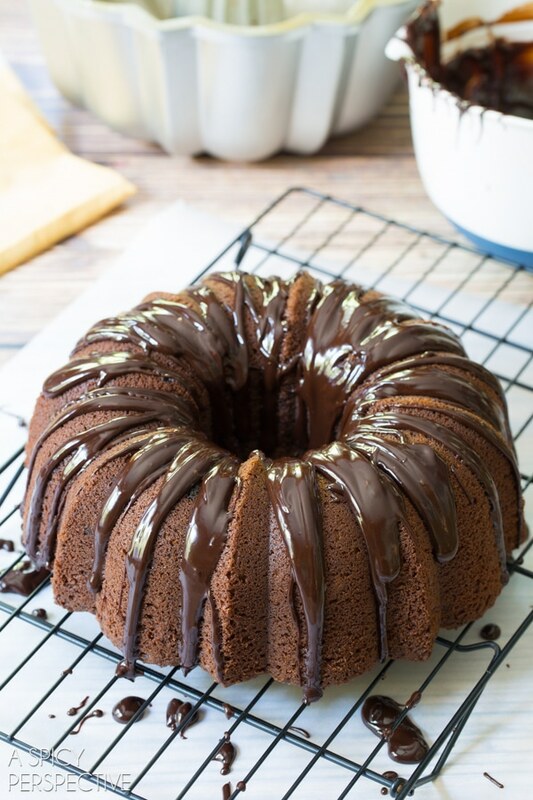 Use a spoon to drizzle the chocolate ganache over the cake. Then warm the caramel until just warm enough to drizzle, not hot. Drizzle over the cake. Use a vegetable peeler to shave the chocolate bar over the top of the liquid toppings. Let the toppings set before wrapping the cake. You can, however, cut it immediately after topping! 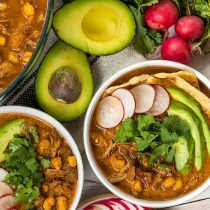 Can I use cream cheese instead of sour cream? If not, what can be used to substitute sour cream? Made this for Valentine’s Day which is also the same week as 2 birthdays in the office. Used the Chocolate&Cherries Baileys. Did not make the toppings for it. Great taste and texture and ingredients came together easily. Will make again. This sounds delicious. Thanks so much for including a picture when I print the recipe out. I love having a picture of your recipe/results so I can remember what to expect. 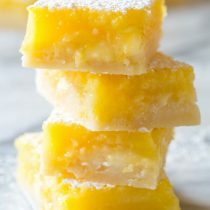 Many recipes print off without photos although they have one in the blog. 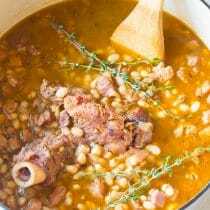 I plan to use this recipe for our St. Patrick’s Day dinner. What a marvelous recipe. I would like to use this for making cupcakes. If I follow the general rule of 2/3 full I should be okay. I know the drizzle of caramel and chocolate won’t be as eye catching but I’d like to try this. Any suggestions. I totally love this cake and have made it several times. I love everything about this cake. But now I want to try it without baileys. (I know that’s the highlight of this cake). I have a toddler and He loves cakes. I want to make a cake that’s similar in texture but without baileys. Any suggestions? What can I substitute it with? I just made this cake yesterday for a dinner party and it was devoured in a matter of minutes. I mixed it a little differently. I didn’t melt the butter. I used room temperature butter and creamed the butter and sugar until light and fluffy. I added the eggs one at a time, blending well after each one. Then I added the sour cream and mixed well. I then added all of the dry ingredients, that I had measured and sifted together, alternating with the Bailey’s beginning and ending with the Bailey’s. The cake turned out nice and light. Hi! Just made this and it is absolutely decadent! Do I store it covered in the fridge? Or would the countertop be ok? Does it freeze well? How long does it stay fresh? Or has everyone devoured it before it had time to sit ? Thanks for the great recipe! Hi Kate! You can leave it out on the counter for a couple days under a cake dome, or place it in the fridge uncovered (as too not mess up the drizzle.) If you want to freeze it, freeze uncovered until completely hard, then wrap well and place back in the freezer. Chocolate ganache and caramel?! Be still my heart! 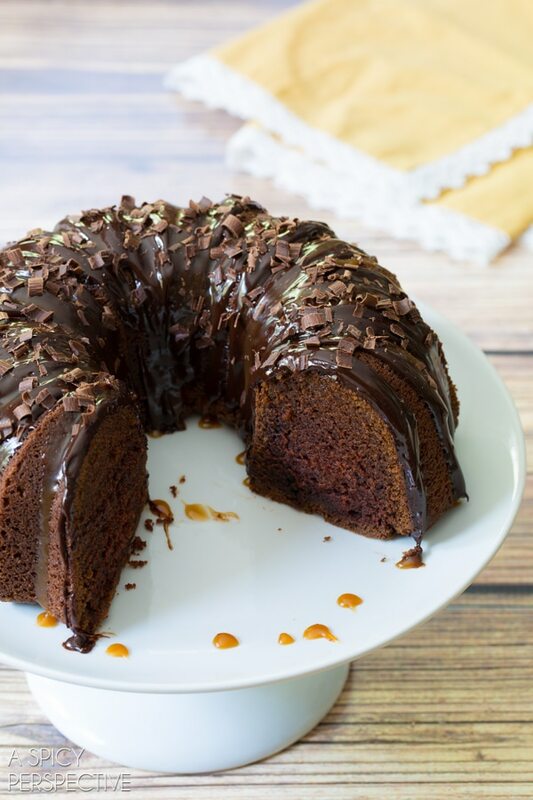 Bundt cakes are highly underrated. This one just went to the top of my list! Ooooooo, LOVE me some Baileys Irish Cream! This cake is beautiful! bundt cake. In fact just to be in keeping, I would add a little Baileys in my coffee. Let’s hope this was not the day I was suppose to go in to my day job that kind of demands my attention to detail. Gorgeous! 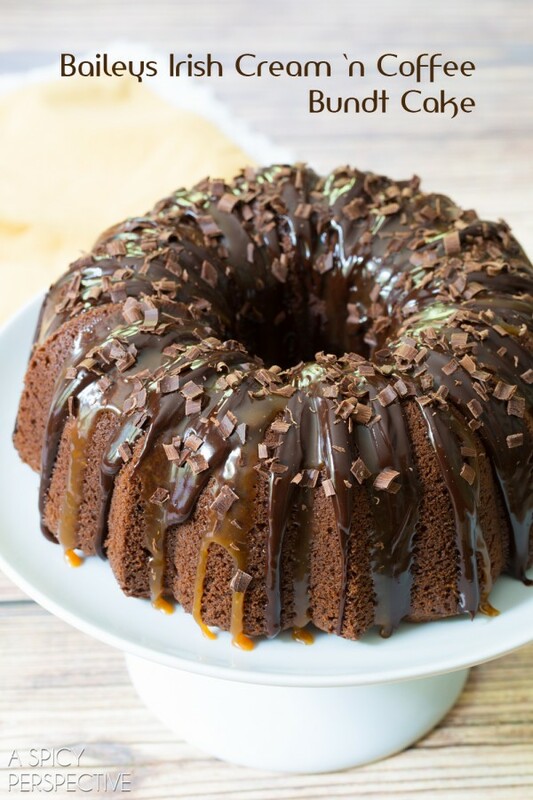 Love everything about this bundt cake! Baileys Irish Cream is fantastic to bake with so I know this cake is a winner! Pinned! Oh gosh golly! Coffee infused cake = vision of heaven at dawn! You’ve earned a big sloppy kiss :) I don’t know where I can find cream of caramel or dulce but I’ll look it on google. 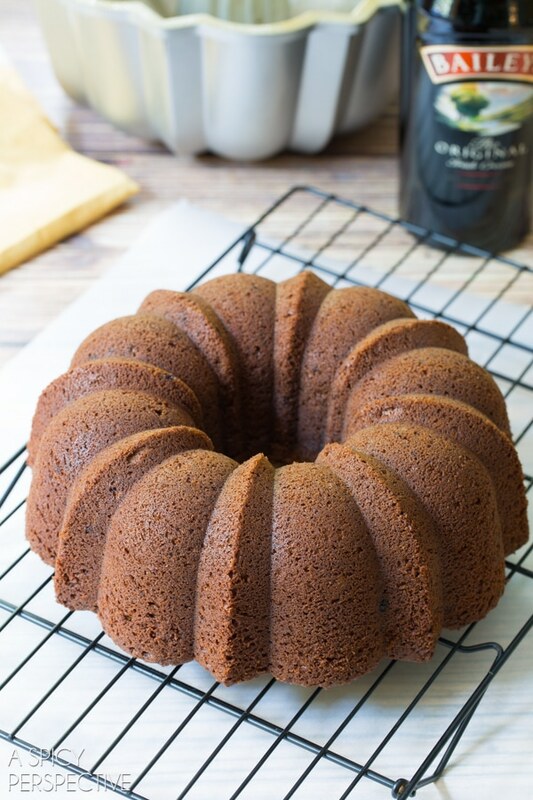 love the idea of using Baileys Irish Cream liqueur in the bundt cake! this is perfection! So gorgeous and amazing flavor combo! Oh my – all those drips are killing me! I love all these flavors. This cake would be DANGEROUS for me! I want a big ol’ slice to get me through Monday! Yep, I want to kiss your face! ;) great cake and great tips! This is gorg! Something about bundt cakes just makes me happy! I really could use a slice of that cake for breakfast this morning. and maybe a few for lunch .. and dinner.. That icing.. just everything.. yum! I’m not sure what part is better. The fact that it’s cake, coffee or chocolate. Love! Happy Monday. Hope it’s a fabulous one! Oh, I bet this is very tasty! The flavor combinations of baileys. chocolate, and caramel go very well together. Now THIS is what I like to see on Monday morning – way to punch Monday in the face!